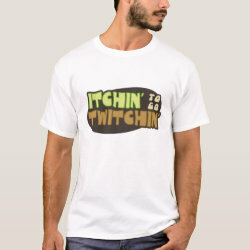 Are you itching for a good twitch? Twitching is so called because the idea of a new life bird or seeing a local or not-so-local More... rarity is enough to make a birder's nerves go completely bonkers. A physical twitching of the body can only be quelled by the chase. 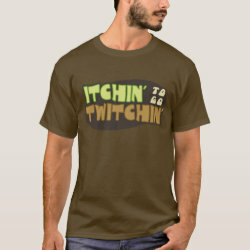 This text design reads "Itchin' to go Twitchin'" in a scratchy font done in a retro-style green and brown color scheme.